Girl's made in Hawaii clothing. New Hawaiian designs, dress styles are added frequently. Many girl's designs are created for matching family outfits. Many designs, styles are matching family prints; available in boy's, men's, women's styles. Search plumeria, hula, hibiscus, floral, Tahitian, flower, turtles etc. to locate selections. 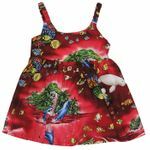 Hawaiian prints depict parrots, turtles, whales, hula girls, ferns and tropical themes. Prints are available in a rainbow assortment of colors. Tropical prints are created in two to five color combinations. Please have fun searching for that perfect girls Hawaiian dress.